Long has made many mud paintings in locations all over the world, predominantly major art museums and galleries. Usually they are on the wall; occasionally they are made on the floor; and since 2003 on board or canvas. Varying the source of the mud and the form of the area in which it is worked generates different type of works: spirals, circles, cascades and lines of muddy hand and foot prints. Long's primary source of mud is the River Avon, near his birthplace and home in Bristol. 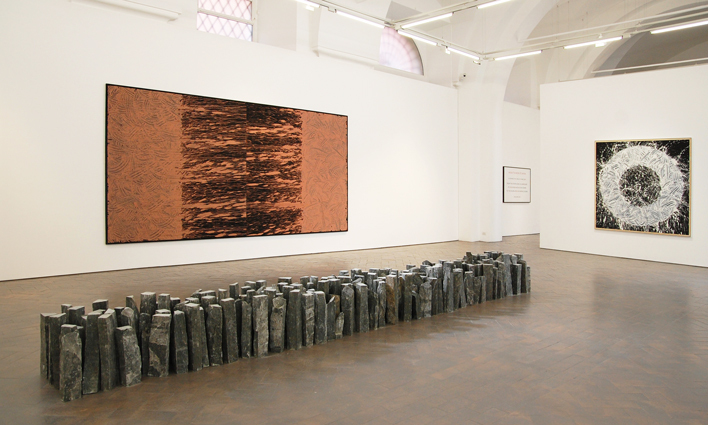 By bringing gathered materials into the gallery to make arrangements on the floor – linear patterns or solid circles filled evenly with stones, slate, wood and so on – or paintings applied with mud by hand on to wall and panels, Long recreates the experience of a landscape inside, asserting an ongoing relationship to the land. His mud paintings draw a line from cave painting forwards, looking at mark making and human interaction within the landscape; and are testimony of a radical adherence to natural means and working within the capability of the human body. Richard Long has been in the vanguard of Land art in Britain since he created A Line Made by Walking in 1967: this photograph of the trail left by his feet in the grass in the landscape, established a precedent that has given way to interventions in all parts of the world. Long structures his experience of terrain from mountains to valleys, beaches, deserts, rivers and snowscapes, according to archetypal geometric marks and shapes, made by his footsteps alone or gathered from local raw materials, which are left as evidence on site. These ephemeral interventions are documented with photographs, maps and texts, where the measurements of distances walked, place names and sightings are vocabulary for powerful, condensed poetry. Although he more readily related to his contemporaries – Hamish Fulton, Carl Andre or Lawrence Weiner – Richard Long is associated consistently with the American emergence of Land Art, environmental art and the Earth Works initiated around 1967. Like them, the sculptor uses the frame and the materials of nature; like them, his works created in situ sustain the erosion of time of which nothing is left but photographic souvenirs.